My netbook was, if not dead, then a bit ill on Friday morning. I bought a new one on Friday evening, failed to install Linux on Saturday morning (because it either didn't like my DVD or DVD drive) and had it all set up and sorted by Saturday evening. Which must be some sort of record. It must be January - January seems to be the time when things break. Then my netbook went. I do have an old netbook, my Windows laptop, my work laptop, the iPad and my iPod, so I'm not bereft of computers. 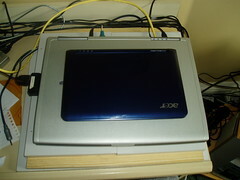 But my netbook was useful for using while sitting on the sofa, especially when too dizzy to sit up at a desk. My laptop is just too big. Fortunately, I mostly liked the 11" one in Currys, so I now have a new one. And I get to spend the weekend putting Linux Mint KDE on it. Which wasn't quite my plan for the weekend. Or how I was planning to use that £250. I remember when tablets first came out and I couldn't see why anyone would want one (unless they had lots of money to spare). I've had my sister's old iPad since Christmas and I'm still struggling to find a use for it, beyond playing games (and most of the games I play on there are also on my computer). My trouble is that I use computers a lot and therefore I use keyboard shortcuts, rather than the mouse a lot of the time. There are quite a few things that I would struggle to find on a menu, but I know how the keyboard shortcut for it. The best thing I ever did with Gmail was to turn the keyboard shortcuts on, so I never have to use the mouse in Gmail any more. Tablets don't have a keyboard. And the browsers on it tend to have symbols instead of text for menu-like items and you can't hover over them to get a tooltip telling you what it does. As a result I'm limited to randomly pressing things in the hope that one of them will do what I want it to. There is also the problem that you can't choose to install old versions of programs on it. There are lots of things I can't install because they require iOS>5 and it can't cope with iOS>5. The more annoying thing is apps that refuse to run until you've upgraded them, but I can't upgrade them. There's nothing at all wrong with the old version, you're just not allowed it. And yet this iPad is not as old as my netbook - where I can not only choose what versions of software to put on it, but also what operating system. Given that the cost of a decent tablet and the cost of a computer are pretty similar, I think I'll just stick to computers. I can put Linux on them. Also, my netbook is far easier to use while lying down and is lighter than the iPad. - Trying to find an alternative for TweetDeck when it suddenly stopped working. On Windows I found I really like Janetter, which works on every platform except Linux. After an entire evening and an entire morning spent trying different programs, I eventually discovered that the best one is TweetDeck - and that's only vaguely usable. That's because in Chrome it uses Chrome's notifications which has two of them pop up for a few seconds and then vanish before you can read one. In Firefox notifications don't work at all. I can't download the Windows version because it seems to think that 4 bytes/second is an acceptable speed and I'm not sure if it works in Linux anyway. And of course there's nothing to tell you what you've read/is unread because who would want to know that sort of essential information anyway? - On Sunday I went to the Olympic stadium for the Anniversary Games. (There are photos, of course). Our seats were amazingly not in the rain, but two rows in front of us were! We were in the sun at the end, but fortunately it wasn't out for too long. It was a great experience and we had a good view of the long jump. It was interesting to see them warm up - they put a little marker by the side of the runway and had a run up without really jumping. Then the bloke sitting by the take-off point put his finger on the board where they jumped from, so then they went and moved their marker, so then they knew where to start. They still seemed to get a lot of fouls, or so it seemed. It was interesting that the women with one leg all jumped off the blade, which suggests it has an advantage. - Today I was only in two days, so they ended up being two days of hard work to get everything in. But tomorrow I am off on the annual windmill trip. One of the (many) things I dislike about the new Compose in Gmail is that once I've got it in a position to be able to reply, I go down to the bit I want to reply to and then get completely lost. There's something in the way it's done the scrolling that means that when I press Page Down it goes down further than I think it will. This problem isn't limited to Gmail Compose. I just had it on the setting pages, it's on 'new' Twitter and just about any page where they put a stupid popup thing along the bottom - basically any page where there's a part of the page that doesn't scroll. In these cases page down moves you down a whole page, but since you can't see a whole page at a time you miss bits. In the case of Twitter it amounts to a whole post. It annoys me so much I can't tell you. I want to read the next page by pressing page down (or spacebar), not press it, wonder if I missed a bit, then press the up arrow. The trouble is that as far as I can tell, no one else does this. I didn't have a big choice of netbooks when I bought this one because there were only two that had actual Page Up and Down buttons - the rest required you to press Fn+an arrow key, which requires two hands and more effort (and moving between tabs in Firefox would be so much more of a pain, since that's Ctrl+PgDn or PgUp). And yet I see people hold down the arrow key or scroll with their mouse. Admittedly that makes me dizzy, but even before I was dizzy I didn't do it. A big thing in LJ RPing back when I was doing it was a site called Plurk, which is Twitter only you scroll sideways. It was their big feature, and it might have been ok, had they used a keyboard shortcut to page left and right. But they didn't, thus making it incredibly hard to read (so I didn't). The best thing ever in Excel was when I discovered how to page left and right (Alt+PgUp or PgDn, incidentally). Despite monitors being wider than they are tall (unless you have a tablet or smartphone) there's not a lot on them that scrolls left and right. Which is fine by me. But tell me I'm not the only one who uses the Page Up and Down keys to read. I went home, so there were computers involved. I spent ages sorting out RSS readers, so I now have RSSOwl on both computers and syncing, so I can read my feeds on one computer and then not have to mark them as read on the other. Which took longer than it should due to me not reading, not typing the right folder name and then, once it was finally working, deciding that I would run out of space in Dropbox and it might be better to use Ubuntu One. Saturday I spent helping Dad taking apart my sister's netbook to get at the hard drive, which was at the bottom, but you could only get to it from the top. It wouldn't have taken so long except that we had one screw that we couldn't get to move. We tried pliers on the screwdriver, three hands, hammering it and heating it up with a hairdryer until I discovered that it required a PH0 screwdriver. Despite Dad having something like 100 screwdrivers, it turned out that none of them were a PH0 and the tiny flathead one we were using instead just wasn't up to the job. A trip to Maplins and sixty more screwdrivers later, we ended up with about four PH0 screwdrivers and it was easy after that. I first used a Mac when I was younger and in the staff room where my parents worked. I couldn't cope with the idea that it didn't have a right mouse button or a button to eject the floppy disk. I struggle with my work laptop a bit when I use it unplugged and it doesn't have a right mouse button on the keyboard. While I was home the other week, my dad demonstrated to me the Mac keyboard he had. He pointed out how it didn't have a delete button, I pointed out that it was missing the page down, page up, home and end buttons. He then showed me his friend's Mac that he was sorting out and how its operating system works differently to Windows and the versions of Linux I've used. I think that annoyed him more, but it was the keyboard that got me. This afternoon I went into town and to kill a bit of time while I waited for my car to be washed I wandered into PC World to play with the computers. While I was wondering if they had any netbooks (they don't - the tablets and ebook readers have taken over) I came across a Macbook Air and I looked at the keyboard. It didn't have the page down, page up, home and end buttons either. Which baffles me. Admittedly, I think I am unusual because I use them all the time. I always scroll with page up and page down. Since I've been dizzy it's the only way I can scroll without getting dizzy, but it's always been the easiest way in the past. When I bought my netbook a couple of years ago the most important thing for me was that page up and page down had their own keys and weren't Fn+another key. So if I had a Mac I would literally not be able to cope with the keyboard, never mind the mouse, operating system or price. Incidentally, my laptop keyboard has a number pad, so I have two of each of the page up, page down, home and end buttons. Which isn't completely necessary, but I'm not complaining. Yesterday I got to play with an iPad, Office 2013 and Windows 8. All of which are varying degrees of frustrating/awful. The iPad was frustrating because it doesn't have a keyboard and I keep wanting to do things with a keyboard. And then its scrolling makes me dizzy (when it actually scrolls and doesn't think you've clicked on something instead or just completely ignores you). I really need to page down, not scroll, but even the keyboard doesn't have a page down key (or home or end or delete - I don't know how you can survive without those). Ultimately I just got bored with it - there are only so many games of Fruit Ninja you can play, even if it is Fruit Ninja HD. It doesn't help that it's harder to use lying down than my netbook is. Siri was amusingly useless. He didn't know most things, couldn't understand most of what I said and told me it wasn't raining when it was. I didn't think that Office 2013 could possibly be that bad, given that it's like 2010, which is what we use at work and I've got used to. It isn't in the sense that they haven't touched the functional parts much. But they have made it all white, which just makes everything hard to see, and the menu headings are all in capitals. Which looks even worse when you hide the ribbon. And they've made it harder to open documents that you haven't opened recently, and there's no facility to pin recently opened folders, which I use all the time in Excel. Windows 8 is fine if you use the desktop - it looks just like Windows 7, with one important part missing. Then there's an app-opening version, which is probably alright if you're using a tablet, but not so much if you're at work. The important missing part is the start menu - there isn't one. If you want to open a program that isn't on the taskbar or desktop, then tough. To be fair, there might have been a way of doing it, but I can't remember. But it also means that the shut down function is well hidden. I spent about fifteen minutes clicking everything until Dad gave me two hints (he'd looked it up) and even then I had to click on things that made no sense and I couldn't work out how to do it with the mouse. It's just as well Windows 8 is the every other release that you skip. I've not been home for a whole day and I've finished all the computers stuff. Yesterday I was at home by 10.30 - the quiet roads made leaving at dawn worth it. So then we installed Linux Mint on my old netbook before lunch. After lunch we cloned the hard drive on my netbook, so now I have one that's exactly the same but without errors. And then yesterday and today I fixed the things in WP I wanted to fix and finished customising the CSS for the comment pages in LJ. All just in time for the Yuletide archive to open, so now I need to read it, while watching my sister play Lego Pirates of the Caribbean. And write my fandom stocking fics. We also did presents. I read the new Simon's Cat book in bed this morning because I woke up early and now I've started Lis Sladen's autobiography. Dad's reading Gin O'Clock (which was also my present). This morning I had a massive excel file I needed to run one macro on. It should have been a case of setting it off on the super computer and coming back when it was finished ten minutes later. Instead it took two hours and involved me running it multiple times when it crashed, opening and closing excel multiple times when it refused to save, and copying out bits of the file when it refused to do anything. And then my netbook refused to boot into Ubuntu. Fortunately it's a problem I've had before and did actually take ten minutes to fix, rather than the two hours it took the first time. Technically speaking, there's nothing to stop me. I have the money, I just have more important things to spend it on. The main reason I haven't bought one is... I don't need one. I have a pile of books that I ought to read and an ebook reader isn't going to help with that. I rarely buy new books and you can't really get second hand ebooks... So basically I'd just use it for borrowing ebooks from the library and sticking pdfs on. And then there's the problem of where/when I'd read it. I wouldn't take it to work because I'd get the piss taken out of me. Although it would help for the times when I don't want to take a book to work to read at lunchtime because I'd have the piss taken out of me. I wouldn't read it on the train, or anywhere public in case it got nicked. So I could read it at home, but you can't read it in the mornings in bed because it's too cold. About the one thing it is useful for is reading while you're eating because you don't have to hold the page open. So in conclusion, I don't need an ebook reader. I wouldn't use it enough to justify the cost. I also want an all-in-one computer - I played with them in PC World the other week. They're really heavy, but so cool. Well, ok, the cool part is the part where you touch the screen instead of using the mouse. Which is handy for solitaire. And probably surfing, but less useful for typing. Not least because you'd have to sit really close to the monitor to touch it, but then you're too close to it to see properly because it's so big. It's utterly impractical, but very cool. Needless to say, I don't need one. I already have two computers and I definitely don't have space for another one. But they're cool and I want one. The one thing I don't want is an iPad. I did, until I played with one in PC World and it was exciting for the first ten minutes, then I got bored. This evening I thought I'd have a relaxed evening, get some stuff done, maybe have an early night, for a change. But so far all I've managed to do is have dinner and spend £500. And dinner required me to cook the chips twice because, due to more than one thing, managed to make one side of them completely black. And I mean completely. And after, my computer decided that I didn't really need to see the screen any more... After spending some time in Safe Mode, we established the graphics card is going. At the moment I have lots of coloured lines on the screen and I am copying my files from that computer to my little laptop. I have a new one on order now, which will have Vista, unfortunately. I still can't find anything in XP because they changed the file system from 98, so I'm just going to be even more lost. And the resolution isn't going to be as big as on my old one. So now I get to play on the little laptop (so glad I have two, although I can also use my work laptop), see if I can get my friend to get my stuff off my hard drive. And see if I can get a long weekend off in a couple of weeks to go home and install everything. And get all the stuff off my last backup (which, as it wasn't the instant before the screen went, isn't recent enough). So my computer might have been slow and full of junk that I've been meaning to delete for years, but I liked it. This is what I've spent most of my past week on (apart from looking at houses): the little blue laptop. I've photographed it on top of my current one to show the size difference. My computer is 15.4", the laptop is 8.9" (I know they're both laptops but I have to call them both something different). It has Linux on it (Linpus, to be precise) so I've spent a lot of time on the forums trying to work out how to do stuff. It's a lot like Unix, so some of it is coming back to me. Biggest pain in the arse so far is my TV. When I plug my computer into it I set it to PC and it shows me a picture. That doesn't work with the laptop, but it turns out what you're supposed to do, is cycle through the options that let you watch two channels at once until you get to PC. At which point it'll show you the picture at 640x480, no matter which computer you plug into it. Which is not helpful, since it only shows you a corner of the screen. Useful. This evening I've enjoyed watching the diving and swimming. Now there's some horses running and jumping. I don't know how they get the horses to do that - in my experience horses generally do exactly what they want. It is quite amusing that when they fall off the horses carry on. It's annoying that all the tennis has been on during the day when I'm at work. Although it is something that's harder to show highlights of, as opposed to swimming, where a race might only last a minute. And the fencing highlights really are highlights, ie bits of fights. With the results listed on the right of the video. So I'll live without seeing the stuff in the week, and concentrate on watching the fencing this weekend. Tonight I bought myself a new laptop! It's the Acer Aspire One, which they promised would be available in red, but it turns out my choices are white and blue. So I picked blue. Although it isn't out till next Monday because I wanted one with 1Gb RAM (rather than 512Mb) with Linux. I ordered myself a wireless keyboard with a touchpad, so I can plug the baby laptop (it weighs just over 1kg) into the 26inch TV and type on a laptop-size keyboard, while sitting on the sofa.